Learning to be polite “starts when you’re babies” say Terri Freitas (r) next to sister Tracy. At one of our parenting support dinners, Tani Katada-Freitas was asked to share her parenting skills in raising ten (10) children. 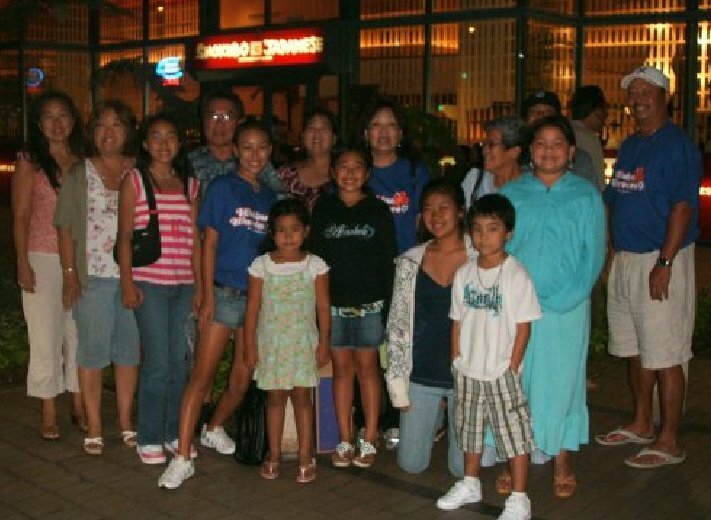 We all know that raising children is a challenge, so how does she successfully raised her five biological children, three stepchildren, and two Hanai (children from other immediate family members). As our evening’s guest speaker, Tani and three of her children arrived early in their modest Toyota station wagon, rang the door bell, where they all greeted us with smiles, the children shy yet so polite. My wife Amy and I welcomed them into our home with hugs and shook their hands. Impressed with the children’s behavior, I asked Tani’s twelve-year-old daughter Terri where they had learned their good manners and she answered “it starts early when we’re babies”. After the other parents and children arrived, we had dinner and fellowship, then started to listen to Tani’s story. Tani was a teenage mom, having had her first child at the age of seventeen. This child, Krystal, will soon be graduating from the University of Southern Nevada, School of Pharmacy, as a Pharmacist. She is married and starting her own family. Tani shared how she began reading to the children when each was four to five months old, and that she constantly read to them. Reading definitely plays an important role in successfully shaping the lives of Tani’s children just as it does the lives of many other successful citizens of our community. Reading works, it is essential in raising children to become successful adults. Tani said that Krystal was an excellent student; her name was regularly on the principal’s list. Tani herself was frequently invited by the Dept. of Education as a guest speaker at various high schools to encourage teenage parents to continue school so that they could be the best parents they could be for their children. Each of Tani’s children had chores, beginning at the tender age of two. An important household rule was: No Chores, No Dessert, simple rule. If the children didn’t finish their dinner it was put into the refrigerator and served for breakfast. And if they didn’t want to finish dinner, they had to go straight to bed. If the children were hungry later in the evening, Tani said “sorry dinner time is over, you’ll have to wait till breakfast”. Every child helped with cleaning the dishes and kitchen after every meal, and there were lots of other chores for them to do around the house. The importance of children and chores is also described in a phrase I like, by Pastor Greg Laurie who says, “obedience starts in the high chair not the electric chair”. Powerful words that are so true. Chores, obedience, and being a good follower starts at home with wise parents. Parents may at times give into children’s tantrums, especially when out in public. Children throw public tantrums because it often succeeds by embarrassing or wearing down the parent into submitting to the child’s will. As parents, we must be patient and wiser for our children, and train them early and consistently in a kind yet firm, loving, and nurturing manner. It is vital that we begin this type of parenting very early in the child’s life, for the longer we wait, the more difficult the child’s negative habits and behavior become to correct. Tani continued sharing her story. She described her use of office folders for what she called the “Folder of Shame”, one of her effective discipline systems. It worked this way: if a child did something wrong, that child had to write a sentence 100 times, for example, “I will not hit my brother or sister and keep my hands to myself”. Writing this was an effective form of time out, and no child wanted a fat or thick folder. Spanking without anger was occasionally used as a last resort. Another house rule was “If you can’t do the time, then don’t do the crime”. House rules were very important and consistently enforced. Tani added “being a parent is like being the head of a company. “You must treat everyone with mutual respect and with that respect they will want to ‘pitch in’ to help”. Similarly, rewards were regularly “earned”; these included keeping one’s room clean, getting good grades, and finishing chores. Tani’s children learned that earning rewards meant earning time to play the XBox, going to a friend’s home, and other fun things that each individual child enjoyed. On a different occasion I met Tati, one of Tani’s older daughter who remembers earning rewards like candy and being taken our to eat, as well as sitting at the table and writing to put into the Folder of Shame. Tati said “I owe this lady so much”. Tani remembers the early tough years of being in an abusive marriage, and once lived for two weeks in her car. To help her cope, she spent time in church at New Hope Christian Fellowship where she helped Pastor Wayne Cordeiro. Today those tough years are a memory as she and her family continue to move forward to overcome these challenges. As with many families, finances are a constant challenge; Tani and her boyfriend maintain their multiple jobs and raise pedigree Pit Bulls which they sell. Any major purchases as well as any family concerns are discussed by the family as a team. Tani is pleased that she did not accept any financial assistance and instead they worked hard to earn money to provide for their family; I could see she feel felt good about this and setting a good work ethic for her children. One of the principles of Starts at Home seeks is to encourage men to love their wives and together raise their children, unfortunately sometimes in abusive and adulterous relationships a separation or divorce is considered by the couple. It’s highly recommended that a third-party such as a pastor or a marriage counselor intercede to assist during these difficult times. Spouse and child abuse is a very serious matter and may be or become a generational problem, sometimes divorce may be a wisecourse of action to prevent the spread of an angry and tormenting spirit. In such cases, the angry person may need a healing process to become a loving parent. To help settle differences seeking wise counsel is imperative; in our marriage of over thirty-five years, Amy and I sought the counsel of our pastors four times; they helped us through our difficult challenges. Tani, thank you for sharing your encouraging stories, parental wisdom and insight as you continue to love your children. Starts at Home potluck luck dinners are held on the second Tuesday of month; information on these parent’s meet ups are posted in this blog under the Classes Menu. These dinners are open to the public. Because our parents and children have busy schedules, dinner starts early at 5:30 pm and done by 8:00 pm. Parents are married, single, and blended families; all are welcomed. For more information call (808) 937-4392. Aloha!